On 13 and 14 January 2018 Ashfia Ashrif, Manchester based Artist and Student of Traditional Arts, delivered a two day course named “Introduction to Turkish Motifs in Ottoman Times” at FSTC House. This course aimed to outline and celebrate the diversity of art contributions from Muslim Civilisation, in particular during Ottoman Times through learning and application. It further intended to inspire and enthuse attendees to promote material and knowledge learnt whilst enabling understanding of Muslim and specifically Ottoman contributions to encourage intercultural respect and appreciation. Attendees were made aware of various art, design and architecture contributions that were made during Muslim Civilisation and Ottoman rule including intricate carpets, geometrical art, horseshoe arches, honeycomb vaults and rose windows. 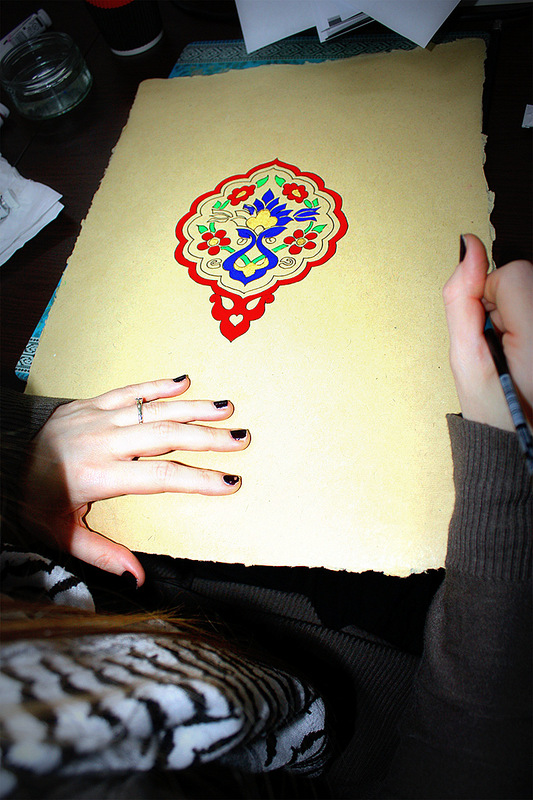 The type of art that was discussed in particular was Turkish Motifs. Three ways in particular those Islamic art motifs were disseminated included, direct imitations, transposition of source or media or using inspired motifs to develop a particular style or fashion of art[]. With the Ottomans granting trade rights to the Dutch in 1612 CE, the tulip became the most popular decorative motif in not only Ottoman governed land but in the Netherlands, also. Books were written about this flower and the tulip became a part of daily life and in a short period of time, the passion for tulips, or “tulipomania”, made the flower a popular theme for Dutch painters. What is more, floral patterns were favoured for the decoration of interiors in Ottoman Architecture; they were also widely used on wall tiles. I.e. Iznik tiles (particularly during 16th and late 17th century) were used to adorn the walls of mosques, tombs and palace buildings. Traditional Turkish Motifs have played an important role in Ottoman Arts due to their symbolic meanings and styles[]. 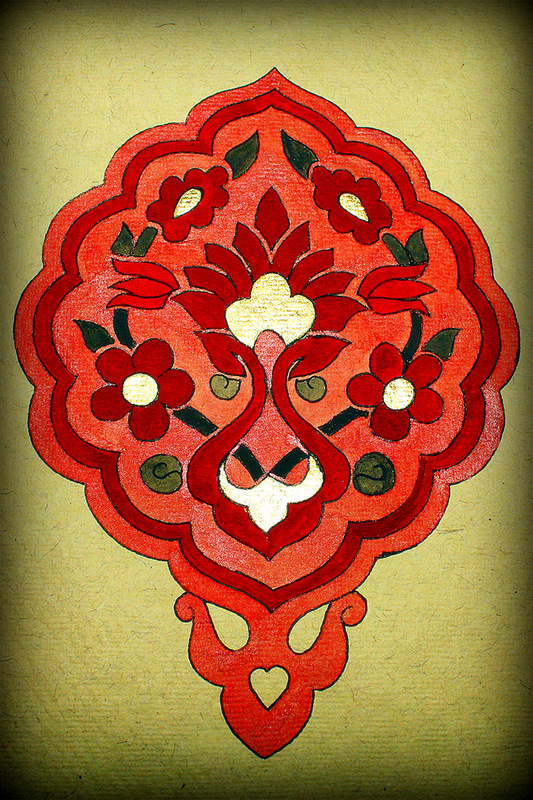 Ashfia introduced some of these motifs, focusing particularly on Rumi styled shapes e.g. Hatayi, penc, cloud, crescent, star, tulips, carnations and hyacinths. Ali, W., (2007). Beauty and Aesthetics in Islam: http://www.muslimheritage.com/article/beauty-and-aesthetics-islam. Last accessed 25th January 2018. Ali, W., (2006). Islamic Art as a Means of Cultural Exchange. Available: http://www.muslimheritage.com/uploads/Islamic_Art_Means_of_Cultural_Exch.... Last accessed 24th January 2018. Argit, B. I. & Ayduz, S., (2012). Jewels of Muslim Calligraphy: Book Review of “Female Calligraphers: Past & Present by Hilal Kazan”. Available: http://www.muslimheritage.com/article/jewels-muslim-calligraphy-book-rev.... Last accessed 25th January 2018. Derman, U., (2007). The Art of Calligraphy in the Ottoman Empire. Available: http://www.muslimheritage.com/article/art-calligraphy-ottoman-empire. Last accessed 25th January 2018. Saoud, R., (2008). Sheikh Zayed Great Mosque in Abu Dhabi: Islamic Architecture in the 21st Century. Available: http://www.muslimheritage.com/article/sheikh-zayed-great-mosque-abu-dhab.... Last accessed 24th January 2018. Rabah Saoud. 2010. Introduction to Islamic Art. [ONLINE] Available at: http://www.muslimheritage.com/article/introduction-islamic-art. [Accessed 17 January 2018]. Prof. Dr. Gunsel Renda. 2006. The Ottoman Empire and Europe: Cultural Encounters. [ONLINE] Available at: http://www.muslimheritage.com/uploads/The_Ottoman_Empire_and_Europe1.pdf. [Accessed 17 January 2018].